The Reformed Old Catholic Church is there for those who hurt, and feel left on the outer rims of the mainline church, and for lots of reasons feel unaccepted. We are there to build these people up and show them the Love of Jesus and the teachings of the Gospel. With in a Sacramental Church. In the 1990's David began his seminary studies, which involved four Preaching & Healing Ministry Crusades in Victoria, New South Wales and Queensland, as Practical "hands-on" experience. In 1989 David was ordained as a Pastor, in April 2000 David was issued his religious marriage licence by the Australian Attorney General's Marriage Celebrants Family Law Section. In 2003 David completed his studies and was issued with his Diploma and Bachelor of Theology. David had been accepted into the Order of Saint Benedict which is a world wide community of Monks. In a monastery with out walls. David has from time to time worked and worshiped with both Traditional and Non-Traditional Congregations, so as to promote Inter-Denominational Relations. Upon joining the AOCC David was appointed Vicar General for Queensland and Abbott for Australian of the Order of St Benedict. Shown here is Retired Presiding Bishop Ian Adrian. 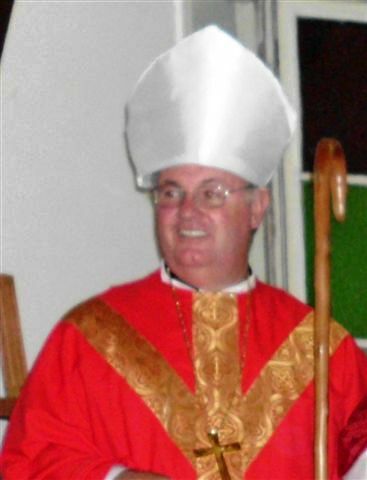 Presiding Bishop Ian Charles Adrian OCSR was born in 1966 and raised Anglican, in 2001 he was ordained Priest for the Anglican Church International Communion there he served as Dean of St. Andrew's Cathedral and Archdeacon for Brisbane and surrounding region. In 2008 he joined the Reformed Catholic Church and was consecrated Bishop on October 3rd 2008. In November 2009 he was elected to be the First Archbishop of the Australian Old Catholic Church.